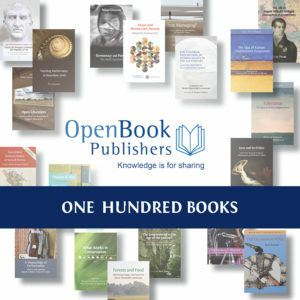 This is the third and final part of a three-part series of blogs to celebrate the publication of our hundredth book. To read the first part, click here. To read the second part, click here. One of the major drivers behind the development of Open Access is technology. The internet allows us to make our books available online, and the ready availability of cheap mobile devices means that people all over the world can access them. Technological development in the internet age is partly fuelled by open source projects and phenomena such as crowdsourcing, which harness the willingness of skilled people to work together and share the fruits of their labour for others to develop further. We are excited about the possibilities that exist thanks to this open culture and we are active participants in this exchange. OBP, along with five other publishers have partnered together as part of a new EU project, HIRMEOS, which aims to develop a number of new services for Open Access monographs across existing platforms. Specifically, we plan to create database architecture, protocols, usage data collection and aggregation tools for our own use and for other Open Access publishing initiatives to take up. This undertaking marks the first steps in an exciting new direction for us, to systematically develop and release our existing publishing software as managed Open Source content, and so enable easy adoption by other and new OA publishing initiatives. Over the past 9 years we have developed an efficient digital book publishing process – allowing us to reduce our average cost of book production to less than £5,000. This compares to figures about 5 times higher from ‘legacy’ publishers. Unfortunately there remain technological barriers that make it difficult for new Open Access initiatives to reach traditional markets. We are committed to reducing these barriers as far as possible by making our own technology more easily accessible for other publishers and new initiatives to adopt. We are committed to releasing all our software as Open Source, and have launched a GitHub account to host the growing content of Open Source software we are developing. Our intention over the next two or three years is to have our complete publishing operating systems available as Open Source content on our GitHub account. Ensuring that the system and software is designed with a modular enhances the potential for individual packages to be adopted and adapted by users. In this way we aim to bring wider and long-term benefits to a host of educational projects. This entry was posted in Notes From The Editor and tagged 100th Book, Academic Publishing, Open Access, Open Book Publishers. Bookmark the permalink.